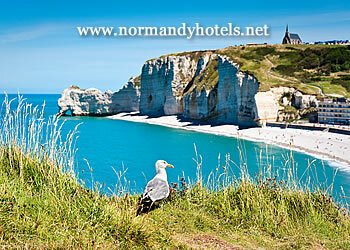 There are few parts of France that are so familiar to the English-speaking world as Normandy. The Bayeux tapestry is a part of the history that changed the Norman neighbour across the English Channel forever. That invasion was reversed many centuries later towards the end of the Second World War and the D-Day beaches of Lower Normandy bear witness to the sacrifices made during the landings and the campaign that followed. 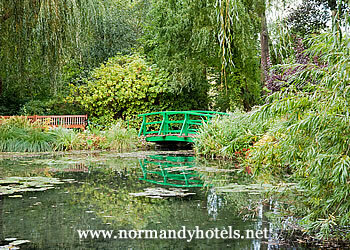 But Normandy isn't just about history, as fascinating and as turbulent as it has been. Many people who would not classify themselves as art lovers would be able to identify the lily pond which was painted time and again by Monet in his gardens at Giverny. Others would recognise the images of the stroll along the windy boardwalk created by other Impressionist painters. The landscape offers plenty of variety - to the north, the beaches and cliffs facing the wind and water of the English Channel, while inland, the soil is rich and the farming is extensive. The produce of the sea and the land is another feature of Normandy, with the dairy farming creating cheeses such as Camembert and Pont L'Eveque, the orchards helping to produce local cider and the native Calvados spirit, while the waters around the coast help to preserve the region's reputation as one of the best places to sample seafood. Access is good as well, with most of the major sights and towns under two hours from Paris and its airports and easily accessible from across the Channel via the four main ferry ports. We've tried to put together some interesting information about some of the places and sights that impressed us in Normandy. And, given the name of the website, for each location we have tried to pick out hotels that are a little bit special, places where we would like to stay and, more importantly, where previous visitors have given their thumbs-up. If you have been to Normandy and have any tips or comments about what we have written, then we would be pleased to hear from you. And, if you are just starting to put together your first plans for a trip to Normandy, we hope we have helped you and that you have as much fun and enjoyment as we did in creating this site!